Eventually, I rediscovered those nifty little packets of ranch dressing mix that you could mix with sour cream to make your own dressing. This was cheaper and healthier than buying the bottled form, plus I started using the ranch dressing mix to season other foods, rather than just as the flavoring for my dips and dressings. I used it on meats, and vegetables, which offered a tasty, low calorie way to give my meals an extra oomph of ranch-y goodness. One of my favorite ranch recipes that occurred during this time was my Ranch Roasted Potatoes. So easy and SO delish! I have made this recipe again and again, and continue to keep it in the rotation because the whole family adores it. At one point, I decided to experiment and make my own ranch seasoning mix. This was really a no-brainer because I hated having to run out to the store and buy one of those little processed ranch packets every time I needed it. And all of the ingredients that I needed were almost always sitting in my spice cabinet! Plus, I loved the bonus of not having any of those weird, unpronounceable preservatives or MSG in my ranch. Plus, it takes all of 5 minutes to mix and measure a few ingredients. Using just herbs and spices, this ranch seasoning mix won’t cost you any Points, and you’ll soon find yourself making all kinds of ranch-style foods! Beyond the traditional ranch dressing and dip, you’ve got to try it on roasted vegetables, chicken fingers, popcorn, garlic toast, steaks, or chicken. However, if you have a few extra Points to spare, try mixing in some powdered buttermilk for even more incredible flavor. You can buy this at just about any store, and it keeps for months! I hate buying a whole carton of buttermilk just for one recipe because I always end up having to pitch the unused milk, so using powdered buttermilk instead is much easier (and cheaper!) option. One quick note – you’ll notice that because of the different size and texture of the herbs and spices, keeping everything evenly mixed is hard. The finer textured ingredients – like the onion powder and garlic powder – tend to settle on the bottom of the jar. If you happen to have a spice grinder on hand, you can pulse all of the ingredients a few times in there, and that’ll do the trick. If not, just make sure to give the jar a few good shakes before using to make sure everything is evenly combined. Now that you know how to make your own ranch seasoning mix, I’m sure you’ll appreciate the benefits of having this incredible flavoring on hand to use in so many recipes! 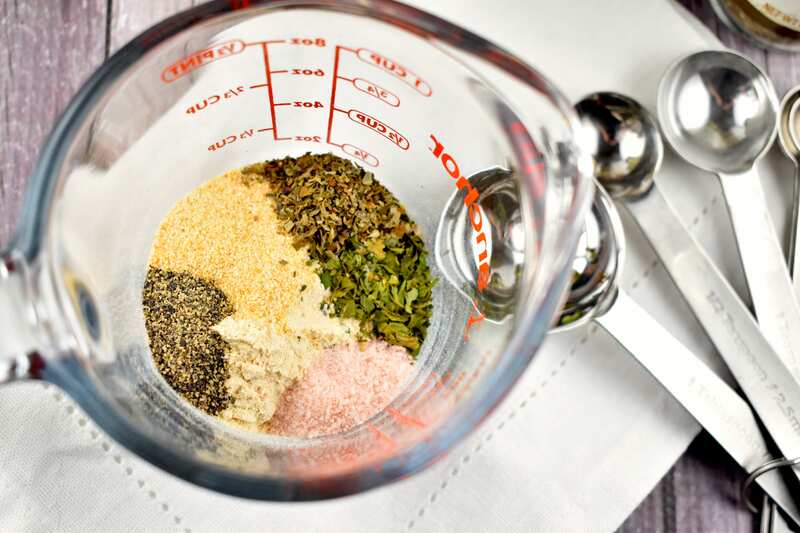 Who knew it was so easy to make your own ranch seasoning mix from scratch? Perfect for making your own ranch dressing or dip! Whisk all ingredients until blended and store in an airtight container.